Fire season across the Commonwealth.kicked off once again February 15, 2017, with many people still dealing with the devastation and aftermath of a torrential fall season from 2016. Two states that were heavily impacted, were Kentucky and Tennessee, but one state, with one area in particular, was much more drastically impacted than the other, leaving many scratching their heads and wondering why there was such a drastic difference. Both states were in extreme drought. Both states had issued burn bans. Both states up until November 28, had experienced a similar fall fire season; had superb fire fighters on hand, were receiving aid from local and state resources and had continuing partnerships with multiple state and federal agencies. They were managing, or rather, the weather was permitting. Weather plays a major role in wildfires. In 2016, scores of weather stations throughout the South recorded record-breaking temperatures in October and November. A long-lasting and severe drought had made the region particularly vulnerable to fire. But temperature, wind and moisture contributed to what would become – in Tennessee – the perfect storm. Temperature affects the sparking of wildfires because heat is one of the three pillars of the fire triangle. The sticks, trees and underbrush on the ground receive radiant heat from the sun, which dries this potential fuel. The warmer temperatures allow fuels to ignite and burn faster, adding to the rate at which a wildfire spreads. For this reason, wildfires tend to rage in the afternoon, when temperatures soar. This was especially true in Kentucky and Tennessee. Wind has the biggest impact on a wildfire’s behavior. It’s also the most unpredictable factor. Winds supply the fire with additional oxygen, further drying potential fuel and pushing the fire across the land at a faster rate. In other words, the stronger the wind blows, the faster the fire spreads. Kentucky, during this time, had maintained relatively calm winds of 5 to 10 mph, compared to the fire in Gatlinburg, Tennessee, which had wind speeds at times in excess of 87 mph. While wind can help the fire to spread, moisture, in the form of humidity and precipitation, can slow the fire down and reduce its intensity. When the humidity is low, meaning that there is a low amount of water vapor in the air, wildfires are more likely to spread once started. The higher the humidity, the less likely the fuel is to dry and ignite. Despite the drought, the relative humidity (RH) levels in the southeast part of Kentucky were not extremely low for most of the month of November. So while Kentucky did not receive enough rain to keep fires from spreading, it did receive enough moisture to keep the fire intensity lower. Mother Nature had dealt Kentucky a helping hand with RH and humidity recoveries. Tennessee had much of the same situation except that they had been in a drought longer than Kentucky and did not have as high a RH so their fuels stayed dryer longer. And that meant less moisture and more fire. However, there were two things working against firefighters during this time in Kentucky. The first was the late and seemingly endless falling of leaves. Many of the 511 fires that burned more than 52,000 acres had to be revisited each day to reconstruct fire lines due to leaves falling and covering the containment lines. In some cases, fires restarted in already burned areas because enough leaves had fallen to create a vector for the fire to cross into an unburned area. Valuable resources that could have been used to quickly respond and attack new fire starts had to be redirected back to areas once thought to be already controlled. The second issue is that fires occurred in logging slash and in areas that burn year after year. In those areas, the underbrush is very thick and full of downed trees. The drought allowed woody fuels (debris 3-6 inches and larger) to burn completely – and for days. In addition, access to these areas was difficult and slowing suppression efforts. While this larger fuel load was burning, it meant that resources had to be kept on fire lines day after day looking for these hot spots and making sure that they didn’t blow sparks across the line which of could ignite or reignite fires. 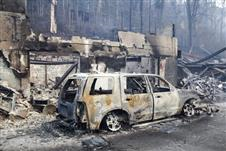 But a much larger fuel problem was to be found in Gatlinburg and Sevier County, Tennessee, which is located just outside the boundary of the Great Smoky Mountain National Park. The destruction of the Eastern hemlock trees by the non-native insect called the Hemlock Woolly Adelgid (Adelges tsugae) had created a major fuel problem. Hemlock trees are some of the largest and most common trees in the Great Smoky Mountains. With over 800 acres of old-growth hemlock trees and 90,000 acres of younger hemlock forests ranging in 75-100 years of age covering the parkland, the adelgid infestation had devastated the trees for more than a decade, so there were a surplus of dead and dying trees available to fuel a fire. Dying trees were not the only form of fuel however, and one of the most dramatic and sad sights to see, were the burning of homes, schools and businesses. The Wildland-Urban Interface, or where structures and communities meet or intermingle with undeveloped wildland- what Gatlinburg has been known for is- unfortunately one of the reasons so many homes and structures were lost. The force of the winds was what it all really boiled down to in the end with winds in Kentucky and Tennessee playing a crucial factor in the differences between the states. Some might say that Kentucky got very lucky last fall, even though it experienced a fire season on the magnitude it hadn’t seen in almost two decades. Most of those people would be correct. Kentucky did get lucky – in that it didn’t receive the winds or the critical relative humidity that Tennessee and some of the other southern states experienced during the same time period. On the other hand, during the fire emergency, the Kentucky Division of Forestry and partnering agencies extinguished almost twice the number of fires, burning twice the amount of acres, without calling in federal resources to manage the incident. Kentucky learned that a collaborative effort between multiple state agencies including KDF, KDFWR, the Kentucky Fire Commission, the Kentucky National Guard, the various divisions of the Department for Natural Resources, the Department of Corrections and the state Emergency Operations Center could be highly effective in managing and overcoming such a massive and long-running conflagration. A Blackhawk filling a Bambi Bucket. Photo by Brandon Howard. Smoke from the fires over Chenoa Lake in KY. Photo by Brandon Howard. Wow, wonderful weblog format! How long have you ever been blogging for? you make blogging glance easy. The total glance of your site is magnificent, let alone the content material!